Making this recipe of Caldinha de Peixe (fish) made me remember my dad. He loved this curry for the subtle sweet flavors and less heat. He also loved any kind of fish as he grew up on a beautiful small island and had access to fresh seafood all the time. In Goa the fish used to make this recipe are pomfret, king fish, prawns or pumpkin. Since tilapia is more readily available in the stores I used it. Caldinha is a popular dish made for feast celebrations. I have seen a variation of recipes online some with vinegar, tomatoes and ginger. I am sharing with you our household recipe that I remember that does not include the above. On a side note when vinegar was suggested there was a mention of the coconut milk cuddling. My suggestion is to skip it as the required sourness is achieved by adding tamarind. You can make a few different variations to this recipe. It can be made vegetarian or vegan by adding pumpkin, mushrooms, cauliflower, zucchini, deep-fried tofu or deep-fried paneer. As it is way less spicier it is kid friendly as well. Wash the fish apply salt and keep aside. Grind garlic,cumin, coriander seeds, peppercorns, tamarind and 1/3 of the onion along with couple tablespoons of coconut milk. Heat oil in a pan, add the remaining chopped onions, saute till soft. Next add turmeric, the ground paste and saute for 2 minutes. Add the coconut milk, water and simmer on medium heat uncovered ( else it will spill). Finally add the fish, season with salt and cook uncovered for 10-15 minutes on medium low heat till the fish is cooked. Serve hot with white rice, appam( rice pancakes), bread or sanam( steamed rice cakes). 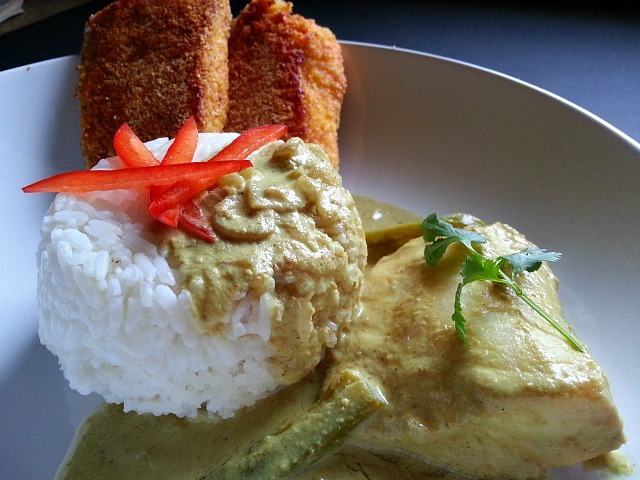 A perfect Goan meal would be rice, curry and some nice crispy Goan fried fish…yum! looks so yummy! I am marking too many recipes on your blog to make :). Looks really creamy and the ingredients are almost completely what I have in my cupboard.. I’d use different fish though..
Yum – this looks delicious. I’m definitely going to have to try it. Yumm! 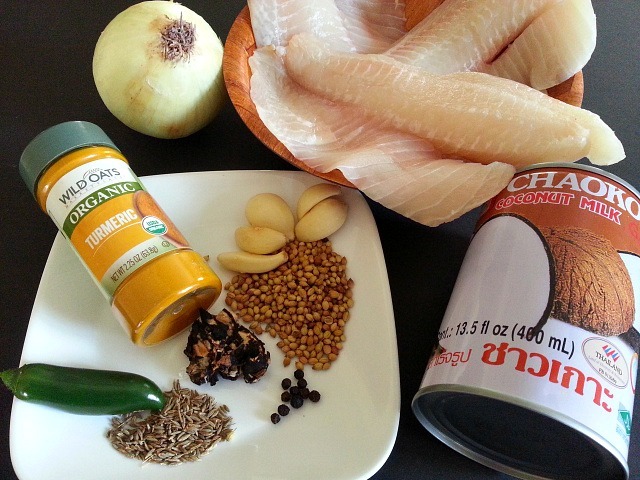 This curried tilapia recipe is making my mouth water just thinking about it! I will have to check out our local ethnic store to see if I can find that special ingredient you mention. Reblogged this on dawnspitfire's blog. Thank You so much for the re-blog 🙂 . Appreciate it very much. These recipes look so delicious! I am a person who avoids heat nowadays because of stomach problems but will be nice to make these for others I know will love them. Thanks for your comment on my poem:LOVE or LUST? Thank You so much. I guess we both are daddy’s girls. It is hard to lose a parent. Nandini’s recipe makes me hungry. Thanks for the follow Nandini! I came to check yours and I’m delighted to find your blog. Theirs some great recipes I’ll try. This fish curt will be one of them. Keep up the good work. YUM!! Bad idea to read this at my desk when I can’t pop out and make it! Great pic too! Absolutely my favorite comfort food- fish curry with rice. 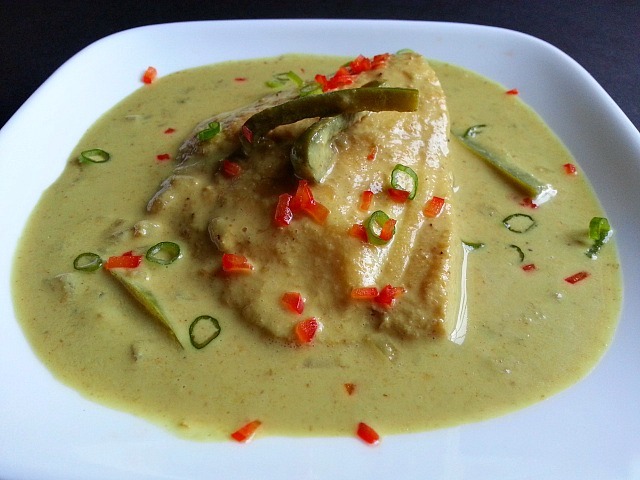 I love the tatste of pomfret, prawns or king fish in this curry too. I could also relate to you thinking of your dad as I miss mine very much too. Thank You so much Sandhya…It is tough to let go. I hope you are coping well. Take Care. Thanks Nandini. It is really tough, isn’t it? Nandini, this looks so amazing. I love fish and the idea of these flavours put together, sound fantastic :-). I must admit I have not heard of Tilapia fish here in South Africa, but I am keen to try this dish with available fish here. Thank you for a lovely blog. Iynne, thank you so much for your kind words. You can use Hake fish or less boney fish, crabs and shrimps as well. A beautiful styling of what looks like absolutely delicious food. Oh, thank you! 🙂 I LOVE the place!! Anything this beautiful must taste good. 🙂 Coriander and cumin are among my favorite spices. The images of your food preparation are always very well presented. Tasty! 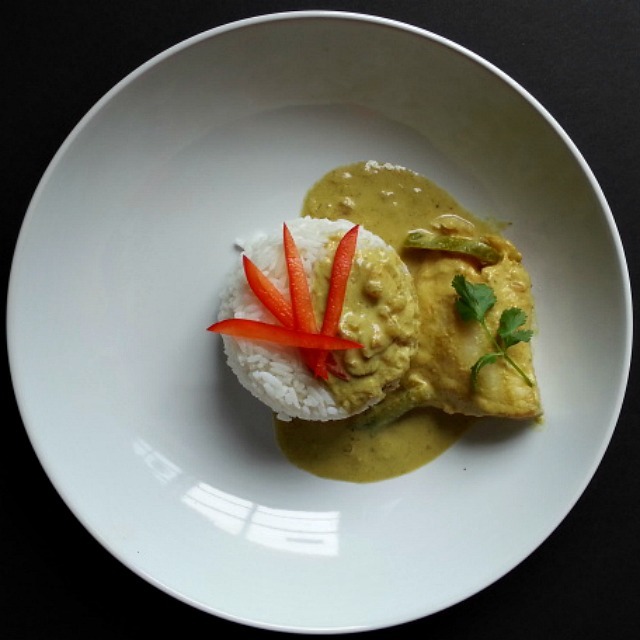 Loving what goes into this beautiful dish, will have to make this very soon, yum…. Thank You Laura so much. Please let me know how it goes. you too take care and have a great weekend 🙂 . Caldinha de peixe looks OUT OF THIS WORLD. This is a dish to DIE FOR, It has left Me totally flabbergasted, on a saturday morning in the UK. Nandini. there could not be a better way to start the weekend. Again it had to come from You. Just the other day We were talking about some Goan dishes, which are not prepared so much this days, in Goa. In other words, they have been just forgotten about. What a shame that is You come up with some YUMMYLICIOUS recipes. I am REMINISCING about Goan fish and the years gone by. What a feeling. By the way do You import the Goan palm vinegar to the U.S? I feel the Goan vinegar defeats all the other vinegars of this world. And if I may say this You are a ‘CHEF PAR EXCELLENCE.’. I have already emailed this recipe to Malcolm and I think He will fall in love with CALDINHA DE PEIXE. I can feel it in My bones. Caldinha de Peixe has got to be the PIECE DE RESISTANCE of any GOAN’S meal. And that’s COLOSSAL. Thank You so much Mr Stan for your kind words. You are right a lot of the old recipes are being lost with time and modernizations. As I make these recipe for my blog I do realize it more and more. I do not import the vinegar as of now but hopefully in the near future as I do get a lot of inquires about it. You and Mrs Stan take care and have a great weekend. Sounds great! Now I know what to have for lunch today 🙂 If it was up to me I would eat fish every day but the rest of the family aren’t too keen. Oh yum yum yum ,definitely going to try this – not sure if I can find Tamarind here though! what would you suggest as alternative? I agree on the tamarind, and I love the benefits from tamarind as well. This is a beautiful dish. Gorgeous job! Don’t think you are limited on what fish to experiment with on this either, are you? Thank You so much. You are right, it serves as a great curry base for any fish 🙂 . Nice plating and photos. This recipe looks yummy! I hope to. I’ll let you know!